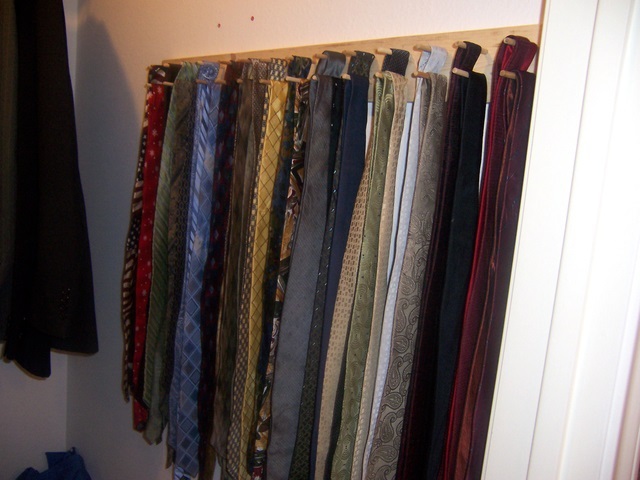 I finally put up the new tie rack that my pop made and Mither and Auntie-Poo brought with them when they came to visit last week. No more ties on the floor! I can’t wait until John gets home and sees! Now he owes me-big time! Behold! The Wall O’ Ties. It looks good! You did a great job! Looks great. Pop will be so proud! Sweet! Do you travel? I have a whole liquor cabinet I need help organizing. Wow, that is impressive. Brad has this cedar thing with hooks on it and the ties are always slipping off.